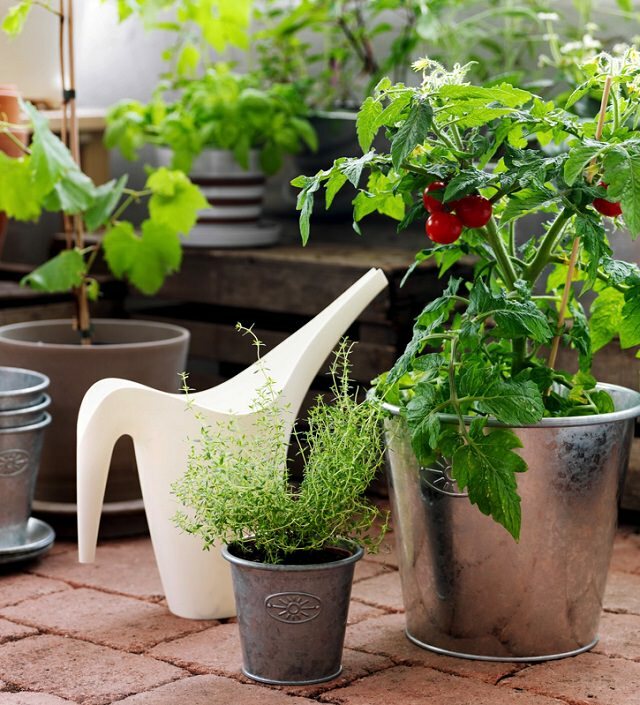 Instead of having a dull and deserted balcony where you usually keep your trash or old, unused items; chairs with faded color, brooms or vacuum cleaner you can use it to create a tiny balcony KITCHEN garden. Which, when the time come will reward you with the HARVEST of aromatic herbs, fresh and organic vegetables, and juicy plump fruits with great flavor that you can never get from store bought edibles! You’ll need to dedicate some time from your busy urban life to look after the plants you’ve chosen to grow. 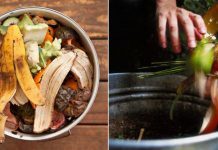 Since you’re not growing a real garden– 15 minutes a day would be enough for the most basic tasks like watering, pinching, pruning, and deadheading the fading flowers. Minimal effort and the maximum result– for this you’ll need to be consistent! The right amount of watering, avoiding both the overwatering and underwatering, fertilizing plants on time, pruning, transplanting must be done as per scheduled. Planning is the most crucial part here. You have limited space and that’s the real challenge– How to utilize every inch of space and improve the productivity of crops. Also, choosing the right kind of plants and varieties according to your climate is required. Opt for vertical gardening ideas and you’ll be able to double up the planting space. 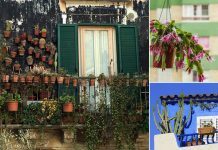 Not only the simple pots, on your balcony– install railing planters, wall planters, add some stack planters and hang a few hanging baskets to create space. Grow more climbers, vines, and plants that grow vertically. You can also place plant stand like one in the picture above or else DIY a ladder shelf or planter which will provide you more area to arrange your pots. These are really basic needs and you might already know about them. For example, use a soilless potting medium as this is light, doesn’t thwart the drainage, and permeable. Take a look at the direction and amount of sunlight you receive in your balcony. For a kitchen garden, it should receive at least 6-7 hours of direct sunlight. However, if you live in tropics most of the plants will thrive in fewer hours of sunlight too. Always apply organic fertilizers and use large pots instead of smaller ones for the plants like tomatoes, peppers, and lemon tree. 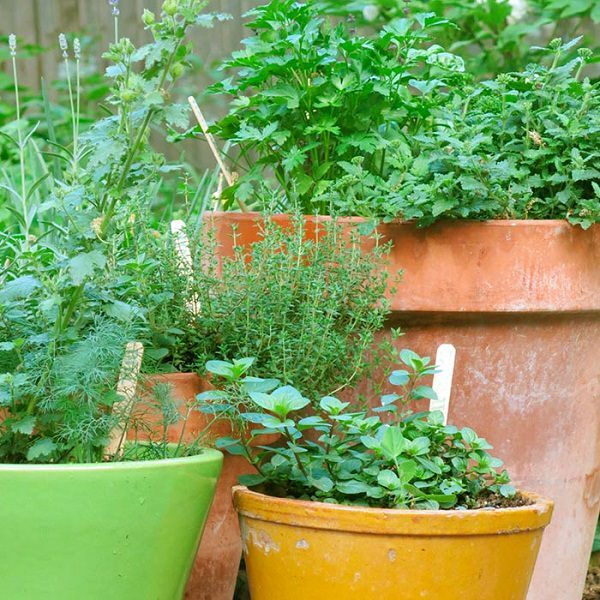 If you’re new to edible gardening, start with herbs! They are the easiest plants to grow and you can grow them anywhere (unless they are not receiving a few hours of sunlight). 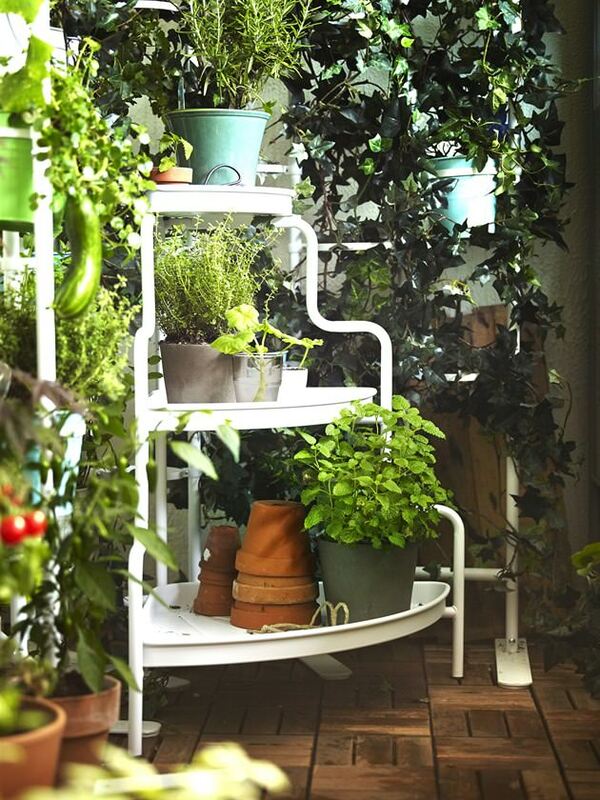 See balcony herb garden ideas for inspiration. Choose your favorite herbs according to the growing conditions and climate. Sow the seeds or bought a few plants from your nearby nursery. Chive, mint, thyme, basil, oregano, parsley, cilantro, whichever you like. Don’t forget to check out our list on easy to grow herbs! 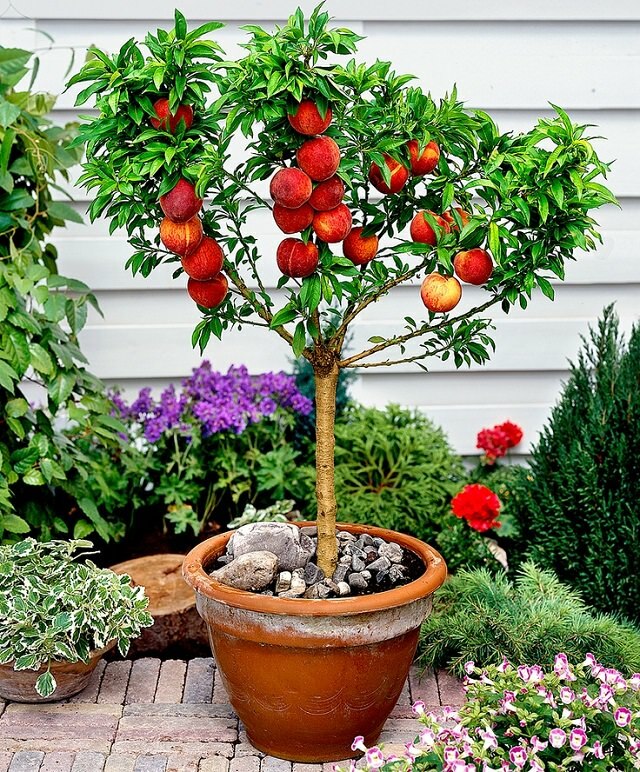 Not only the herbs and vegetables, growing fruit trees in containers is possible, even in a limited space like a balcony! Lemon tree, strawberries, apple, pomegranate or watermelon if you like. The list of the fruiting plants and trees is big. You can read more about this in detail in our article. 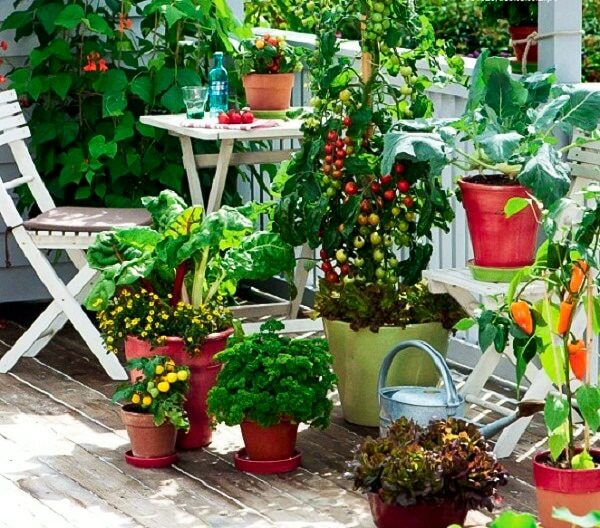 You can grow almost any vegetable plant on your balcony kitchen garden (if growing conditions are appropriate). For bigger plants like zucchini, tomatoes, eggplants, cucumbers or other fruit vegetables like peppers, okras, and beans– choose pots that are large and at least 30-40 cm deep. Herbs, leafy vegetables, salad greens, radishes, and carrots can be planted in wide shallow pots that are 15 to 20 cm deep. Cherry tomatoes, green onions, spinach, beans, and lettuces can be very productive there as they don’t need a lot of space. Beside these you can also grow plants like lavender, marigold, nasturtiums in your Balcony kitchen garden!